In a global market dominated by low-cost natural gas, large and small reactor technologies cannot be competitive. For nuclear technologies to simultaneously increase safety, reduce costs and compete with non-nuclear electricity producing technologies, a radically innovative approach is necessary. 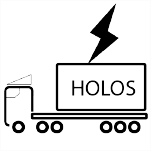 Holos generators adopt a unique architecture that integrates proven commercial technologies to produce affordable pollutant-free electricity with safer melt-tolerant fuels. Holos functioning principles are similar to those represented by a “closed-loop” turbo-jet engine, wherein the conventional “combustors” are replaced by reinforced sealed fuel cartridges. Similar types of nuclear engines were successfully tested as part of U.S. government sponsored programs in the fifties and sixties . Safe and reliable turbojet engine components combined with off-the-shelf products utilized by multiple industries (e.g. automotive, renewable, aviation and stationary power generation), are integrated to form Holos generators power conversion components. Through the unique Holos approach, the typical “open-loop” Brayton turbo-jet engine is modified into a “closed-loop” system wherein the turbojet combustion system is replaced by sealed nuclear fuel cartridges. In the Holos configuration, to further increase safety, air is replaced with a gas (e.g. Helium or Carbon Dioxide) whose energy content is increased as it flows through the fuel cartridge to expand through turbo-machinery and produce electricity. Similar systems were extensively tested through U.S. government sponsored programs. More than 50 years later, Holos takes advantage of modern and safer fuels, closes the loop to further seal all of the components forming the generator and couples the heat source directly to the electric-power producing system. Overall, off-the-shelf turbo-machinery components from aviation industry, direct-drive generators from renewable (e.g. wind-powered systems) and waste heat recovery systems, hybrid automotive and high-power electric motors, inverters and electronic controllers are integrated and sealed to form Holos subcritical power modules. Holos architecture enables substantial design simplifications while enhancing safety, reducing construction and licensing time and costs. This results in a competitive and synergetic alternative to both fossil and renewable technologies. 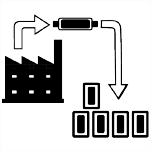 Holos integrates the power conversion components with reinforced fuel cartridges, segregating and shielding the fuel, and eliminating the complex network of tubing, valves, pumps, tanks and heat exchangers normally referred to as Balance of Plant (BoP), typical of large and small modular reactor designs. By eliminating the BoP, the number of Systems, Structures and Components (SSCs) forming the whole design is also substantially reduced inducing further simplifications. Sealed thermal-to-electric power conversion systems are thermally coupled to an independent Organic Rankine Cycle (ORC). In this manner, a portion of the heat unavoidably rejected by the Brayton cycle is recovered to enhance efficiency while supporting process heat capabilities. After shutdown, the ORC components continue to produce electricity by removing natural decay heat from the fuel cartridges. Under all operational and off-normal scenarios the fuel cartridges are cooled by environmental air. Each subcritical power module is equipped with integral turbomachinery directly coupled to the electric generator and the compressor motor. The working fluid executing the Brayton cycle is compressed through the fuel cartridge by the compressor, undergoes heat addition as it circulates through the fuel cartridges, expands through the power turbine driving the generator, and rejects thermal energy to the ORC system. The ORC converts waste and decay heat into electricity while lowering thermal signature. 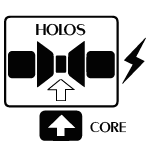 Holos core is formed by coupling a minimum number of independent subcritical integral power modules. 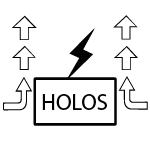 The name Holos comes from the Greek for “whole” as the core is formed by multiple subcritical power modules sealed in independent steel pressure vessels. The resulting coupled core becomes critical (able to sustain nuclear chain reactions) and produces electric power only when a minimum number of Holos subcritical power modules are brought together, thus forming the whole core. Neutrons couple each fuel cartridges through controlled neutron leakage. The subcritical power modules are actively positioned by the Automatic Module Positioning System (AMPS) equipped with fast actuators with features similar to those represented by the redundant flight-control systems employed by the aviation industry. For example, landing gears, flaps, and flight-control surfaces are actuated by highly reliable systems with decades of operational experience. 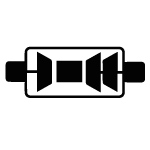 Three-phase, high-resolution load following electric power is produced by regulating the AMPS to increase/decrease the fuel cartridges’ thermal rating with near real-time power conversion (e.g. rapid power increase/decrease characteristics typical of aviation turbojet engines). In case of AMPS malfunctioning or failure, the subcritical power modules reposition themselves automatically or gravity-assisted with multiple and diversified passive features ensuring safe shutdown under all normal, off normal and threat basis scenarios. Different configurations of the design provide scalable power ratings from 3 MWe to 81 MWe with near real-time load following electricity. For electric power demand up to 13 MWe, a single transport container comprises the whole mobile operational generator. The components, can also be transported individually for maintenance, refurbishing or replacement. Generators can be re-licensed for a total life-span of 60 years. 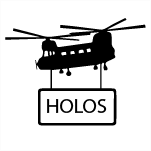 Operational Holos Quad generators can be transported via standard transport platforms (civilian and military) for timely distribution and retrievability. Individual Holos Titan subcritical power modules can also be transported via standard transport platform and made operational by positioning the modules at the deployment site. Holos Quad generators can be retrieved shortly after shutdown as decay heat energy is passively removed via ORC system rejecting thermal energy to the environment. Alternatively, each subcritical power module can be retrieved by utilizing transport shielding crates. Each subcritical power modules continues to produce electricity after shutdown proportionally to decay heat energy. 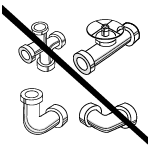 In the Holos design, the conventional network of piping, tubing, fittings, valves and electrical conduits coupling independent components, typically found in various reactor designs (small and large) and referred to as Balance of Plant, is replaced by integrating the power conversion equipment with Holos fuel cartridge. BoP elimination voids risks associated with loss of coolant accidents (LOCAs) while decreasing the design vulnerability to design basis threats and beyond design basis accident scenarios. As each subcritical power module is sealed through multiple layers forming independent pressure boundaries, and the fuel cartridges are entirely segregating the fuel, the risks of radionuclide transports outside of the subcritical power modules is greatly reduced. Holos generators are near real-time load-following, with power generation matching power demand. The relatively low power rating for each subcritical power module, along with fast actuating turbo-jet engine based conversion systems, results in rapid power ramp-up and coast-down. Sensor refurbishing or replacement (e.g. neutron detectors) can be executed via remote operations without “opening” the subcritical power modules during maintenance operations. Atmospheric pressure ports provide neutron coupling with the fuel cartridges and enable instrumentation components insertion and withdrawal. The design is also equipped with additional atmospheric pressure ports dedicated to support production of selected isotopes for medical applications. Each subcritical power module rejects thermal energy as a result of the combined Brayton and Rankine power cycles operations. In the Holos design, the unavoidable thermal rejection to the environmental air (Ultimate Heat Sink – UHS) occurs in two steps: The Brayton cycle components transfer the rejected thermal energy to a closed-loop Organic Rankine Cycle (ORC) integrated and thermally coupled with the subcritical power module reflectors and shield; The ORC condenser is then passively coupled to environmental air through heat exchangers thermally coupled to dedicated ISO container heat exchange surfaces. In this manner, the total amount of thermal energy rejected to the environment is reduced and the thermodynamic efficiency is increased (from 45% to 60%). The closed-loop integral ORC system captures a portion of the waste thermal energy rejected by the Brayton cycle and converts it into conditioned electricity. As the subcritical power module is positioned to execute a temporary or permanent shutdown, its fuel cartridge continues to naturally produce decay heat. The electrical power rate produced under shutdown is proportional to the power history prior to shutdown and the time elapsed from shutdown. Passive natural convective air-cooling maintains adequate fuel cartridge cooling even under Loss Of Coolant Accident (LOCA) scenarios. Additionally, these features decrease thermal pollution, support process heat capabilities via independent thermal-hydraulic loop, and enable safe and separated fluid circulation outside of the subcritical power modules to support urban heating and potable water applications. During normal operations, the ORC components convert Brayton rejected heat into electricity at power rating proportional to the electric power demand (part of the near real-time load-following system). When the fuel cartridges are temporarily or permanently shut down, the organic Rankine components continue to operate to produce auxiliary electricity at power rates proportional to decay heat rates. This feature enables each subcritical power module forming the generator to produce electric power at relatively low power rating for extended amounts of time after shutdown. This is of particular interest for applications in which electric power is required during generator retrieval operations as each independent subcritical power module, even when extracted from its Quad configuration, essentially represents a high-capacity battery for extended time durations. Brayton- and Rankine-based Holos integral power conversion system (no BoP) can be thermally coupled to nuclear cores produced by third parties without need to charge the working fluid at the site of deployment. Under these configurations, installation of Holos integral power conversion system consists of thermally coupling the external nuclear core to intermediate and isolation heat exchangers integrated and sealed within the Holos power conversion system pressure boundary. Helium or Carbon dioxide can be utilized as working fluids when the Holos power conversion system is operated under closed-loop configurations. Depending on the third party external core requirements, Holos power conversion system can also be configured to operate with environmental air as working fluid under various open-loop configurations. For rapid deployment applications (e.g. emergency response), the generator size and weight is reduced and fully comprised within transport ISO containers measuring 20ft (6m) in length instead of 40ft (12.2m), to enable a variety of air-transport platforms. 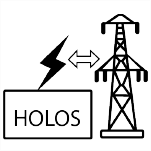 For these applications, Holos generators can be configured to represent “stand-alone” electric islands (no substation switchyard equipment required) as the power inverters conditioning Holos electric power can adapt to local/small power grid voltage and frequency requirements or impose voltage and frequency through makeshift grids when local infrastructure is absent or severely damaged. Fully operational Holos Quad generators with power ratings up to 13 MWe are completely encased in a single transport container with subcritical power modules comprising fuel cartridges lasting 12-20 Effective Full Power Years (EFPY) between refueling. Holos EFPY is based on applications requirements under the constraints of enrichment and generator duty cycle. For the Holos Quad 13 MWe configuration, each subcritical power module develops 5.5 MW-thermal. Each Holos Quad subcritical power module can be transported individually or already coupled and in compliance with transport ISO container dimensional requirements. For power ratings higher than 13 MWe, Holos generators can be formed by larger subcritical power modules coupled by combining multiple transport containers. In these configurations, each module is positioned near one another to satisfy core geometry and mass requirements. For applications requiring power ratings in excess of 60 MWe, a single Holos Titan generator becomes more cost-effective when compared to the cost of 5x smaller Holos Quad generators clustered and coupled to match a similar power rating (e.g. 5x 13 MWe = 65 MWe). The Holos Titan configuration is formed by larger subcritical power modules. As for the Holos Quad configuration, each Titan subcritical power module satisfies the dimensional constraints represented by standard transport containers. Once at the delivery site, the larger subcritical power modules are positioned to execute thermal and neutron coupling to produce electricity and process heat. The Holos Quad and Titan configurations are powered by fuel cartridges that last 5-12-20 years between refueling (depending on low-grade enrichment and application requirements). For Holos Titan configurations, the ORC components are housed within independent retrofitted transport containers. As for the Quad configuration, the ORC modules are thermally coupled to the subcritical power modules without BoP equipment and convert thermal energy discharged by the Brayton power conversion equipment into electricity. As each subcritical power module houses only a fraction of the fuel forming the whole core, and represents relatively small dimensions (comparable to aviation jet engines), full-scale testing to validate and monitor safety performance can be cost-effectively executed at the factory. This reduces costs and expedites construction and licensing procedures. Holos total number of Systems, Structures and Components (SSCs) forming the generator’s modules is substantially reduced. As a result, full-scale testing can be executed on individual subcritical power modules or on the whole generator to satisfy and monitor safety performance standards. Because of these features, factory certification can follow regulatory processes and quality assurance standards applied to aviation jet engines. Overall, the generator leaves the factory fully tested, operational and certified for deployment at any site (no site-specific stressors constraints). When the fuel cartridges are replaced at the end of their fuel cycle, Holos power conversion components can be reconditioned and the generator can be re-licensed to resume operation for a total operational life of 60 years (two additional total fuel cartridges replacement per refueling after the first fuel cycle of 20 years). To substantially reduce decommissioning cost, Holos fuel cartridges and power conversion components are designed to fit within licensed canisters for temporary or long-term storage. As portions of the power components (mainly the electric motors representing the generator and recirculator) are removed from the subcritical power module, the fuel cartridges remain sealed within their reinforced structure during decommissioning activities and all the way to the welding of the storage cask lid. Depending on applications, the ORC components continue to produce electricity at power rates proportional to the decay rate. As a portion of the decay heat energy is converted into electricity, Holos fuel cartridges represent a lowered thermal loading for the dry cask and for underground, unventilated repositories with no active cooling. Fuel cartridge extraction, lifting and repositioning within licensed casks can be executed with conventional hydraulic lifting equipment retrofitted with shields and remotely operated. Alternatively, the fuel cartridges can be lifted with bridge cranes and positioning within dry casks follows procedures similar to those adopted for refueling and storage of conventional light water reactor fuel bundles (no extra shielding required). Holos enhanced safety is inherently achieved by a highly simplified and integrated design with passive redundant and diverse safety features. Holos combined relatively low power rating and components size support low-cost full-scale testing to simulate design and beyond design basis accident scenarios to validate safety performance. Low-cost full-scale testing further supports the implementation of quality assurance programs during components manufacturing, testing and maintenance programs while in operation to assure safety performance remains unaffected over the operational life of the generator. Holos design’s safety features factor lessons-learned from severe nuclear power plant accidents and operational-experience. Modern melt-resistant fuels already offer significant benefits in terms of sealing radioactive volatiles within the fuel itself under all operational and off-normal conditions. To further enhance safety, Holos fuel cartridges seal the melt-resistant fuel within multi-layered and reinforced structures that are passively cooled by environmental air. 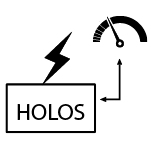 Holos safety features include engineered safety systems addressing Design Basis Threat/Attack scenarios. The subcritical power modules are sealed and each integrates fully operational power conversion components (e.g. turbo-machinery, generator and compressor motor). As a result, they can be transported individually via transport crates with dimensional and weight requirements compatible with standard transport platforms. For the Holos Quad configuration, multiple subcritical power modules can be transported already coupled and all comprised within a single ISO transport container for immediate operability upon arrival at the deployment site. 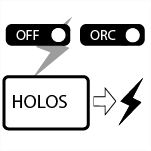 Individual Holos subcritical power modules are inherently unable to become reactive. Only when multiple subcritical power modules are positioned near one another and form adequate geometries, the “whole” Holos core is coupled (becomes critical), thereby enabling electric power production. Fuel cartridges loaded within the subcritical power modules can accommodate different types of fuels and remain sealed at all times from factory to repository. Multiple physical barriers between the fuel and the working fluids circulating through the power conversion components prevent potential radioisotope migrations outside of the fuel cartridges. All components satisfy safety performance and dimensional requirements for low-cost disposal and decommissioning via licensed waste disposal canisters, without exposure of the fuel cartridges internals to operators, the general public and the environment at all times from factory to repository. Holos power conversion components are directly coupled to the fuel cartridge and are all together sealed. Each subcritical power module is further equipped with radiation and ballistic shields. Working fluids are charged at the factory and each power module is fully tested with validated safety performance prior to deployment. No risk of exposure to the fuel for operators, the general public or the environment during installation, operation and throughout reactor decommissioning activities (fuel remains segregated and sealed at all times from factory to repository). Power conversion turbo-machinery components are directly derived from aviation and power generation systems (e.g. gas turbine). Power conversion direct-drive motors and generators are derived from commercial renewable energy and waste heat recovery systems. Similarly, the power inverters formed by IGBT power modules are commercially available and installed to synchronize converted solar, wind and waste heat recovery energy to the power grid. Holos fuel cartridges do not require water to cool down. Passive environmental air-cooling ensures fuel integrity under all operational and off-normal scenarios. After operations, decay heat naturally produced by the fuel is also safely and passively removed via air-cooling. The fuel cartridge maintains temperatures below safety limits even under total loss of working fluid scenarios. Each subcritical power module inherently defaults to a subcritical state under off-normal generator operations. 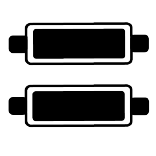 Subcriticality is ensured by the subcritical module positioning system (AMPS), naturally by gravity should the module positioning system malfunction or fail, and by negative fuel temperature coefficient should the modules be positioned to form an erroneous core geometry (subcritical power module dislodgment or misalignment due to design basis attack or design basis sabotage scenarios). None of these scenarios require operator intervention. The generator is near real-time load-following, therefore it automatically adjusts the fuel cartridge thermal power rating to rapidly adapt to the electric load manifesting at its power bus. All of these features are automatic and do not require on-site operators. Key operational parameters are wirelessly transmitted to a processing and control center with protocols similar to those adopted by aviation companies monitoring jet engines in real-time across the world. Inherent passive features and engineered design features enhance the generator’s capabilities in preventing radionuclides migration outside of the sealed fuel cartridges. These features ensure safe operations under design basis threats (including terrorist, airplane crash, radiological sabotage, cyber threats) and design basis attack scenarios (ballistic, explosive, violent external attacks, suicide attacks). Additional safety features include defense in depth redundant and diversified inherent and engineered mechanisms to cope with attacks that manage to cross through shields, reflectors, the pressure vessel, the multilayered fuel cartridge structure and reach the highly reinforced fuel. Holos core mass and geometry are actively matched to follow electric demand by regulating the coupling of multiple independent subcritical power modules. The total amount of nuclear fuel sealed within the reinforced fuel cartridges represents substantially smaller radionuclide sources when compared to nuclear cores conventionally equipping operational and small modular reactor designs. These special features enable a substantial reduction of the Evacuation Planning Zone (EPZ) from several miles, as currently required for operational reactors, to a few hundred feet. Computer Fluid Dynamic, Mass and Heat Transfer analyses show that even under total loss of coolant the fuel cartridges temperatures remain significantly below safety thresholds with passive cooling. The melt-resistant fuel loaded within Holos fuel cartridges has been tested above safety temperature thresholds and demonstrated no release of volatile radionuclides up to extremely high temperatures (that cannot be reached via passive cooling). Each fuel cartridge segregates the melt-resistant fuel and provides mechanical and hydrostatic features that further minimizes migration of radionuclides. The small radioactive sources represented by the fractioned Holos core and the diverse and redundant inherent passive and engineered safety features make the fuel cartridges a substantially reinforced multi containment system. These structures represent multiple pressure boundaries when compared to licensed nuclear fuel transport canisters, transported across multiple countries without requiring evacuation planning zones. Technology Readiness Levels (TRLs) represent an accepted methodology to describe technology maturity. Readiness levels are based on Technology Readiness Assessments (TRAs) executed through formal, systematic, metrics-based processes to determine the maturity of critical components forming the technologies to be used in operational systems. Holos functioning principles and technology architecture represent optimizations of technologies developed in the late fifties. These technologies were conceived and matured through a series of steps iterating various generations of concepts proven by hardware tested at full scale for hundreds of hours at U.S. national laboratories. under programs sponsored by government and industry. 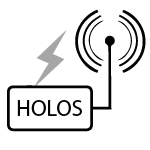 The Holos concept, architecture and hardware utilizes “closed-loop” thermodynamic cycles and modern commercial technologies to form the subcritical power modules. As a result, Holos proof-of-concept, analytical, breadboard based validations and systems prototype and demonstration in operational environments have been executed through similar systems with components validations satisfying TRL-8 “Actual systems completed and qualified through test and demonstrations”. Technologies, materials and engineering tools have remarkably improved since the original compact reactor programs for aerospace applications (concluded more than 50 years ago). Holos further simplifies the SSCs housed within the subcritical power modules, and substantially reduces the core power density when compared to the very high-power density micro-cores tested in these programs. Additionally, Holos fuel cartridges are loaded with fuels enriched below proliferation levels and solely rely on off-the-shelf, commercially viable components and technologies. The components utilized to execute Holos thermal-to-electric power conversion are similar to those developed to satisfy safety performance requirements adopted by the aviation industry. Except for the fuel cartridge, all of Holos components are operational (e.g. aviation turbojet engines and power production turbine-generators). As Holos does not require breakthrough technologies and employs component with power ratings comparable to off-the-shelf commercial systems, the design inherently meets TRL-8 requirements with the majority of its components already commercial and satisfying TRL-9 requirements. Holos fuel cartridge is loaded with melt-resistant fuels validated through decades of testing under international gas reactor development programs. The High Temperature Reactor Pebble-Bed Module (HTR-PM) demonstration power plant constructed in China reached full power in 2003 with connection to the power grid and start of commercial operations scheduled to go live early 2018. As a result, fuel enrichment and manufacturing infrastructure to commercially produce melt-resistant fuels also meets the TRL-9 requirements. Overall, the Holos concept integrates TRL-8 and TRL-9 technologies without requiring breakthroughs to support implementation. As shown in the project organigram under Manufacturability , Stages II-VI comprise full-scale testing of all components through multi MegaWatt low-cost test rigs developed for waste heat recovery systems. Testing includes subcritical power module safety performance validation under design basis scenarios, beyond design basis and design attack/sabotage basis scenarios. Full-scale testing is executed by replacing the fuel cartridges with surrogate thermal cartridges (e.g. based on non-nuclear heat sources) providing thermal energy for the subcritical power module turbomachinery to operate at full power. Under these low-cost testing configurations, subcritical power modules can be coupled to subsystems and operated under all credible operational, off-normal and sabotage scenarios. As part of full-scale testing activities, the reinforced fuel cartridge structure can be subjected to mechanical stressors involving pressure, vibrational, structural and thermal-cycling to validate technical and safety performance. Similarly, testing of the AMPS, and power electronics and controls can be executed at full power with dynamic electric loads to simulate unstable electric grids and validate the near real-time high-resolution load following features offered by the design. Operational multi MegaWatt test-rig hardware and power systems developed to validate performance of Waste Heat Recovery Systems (WHRSs) under transients and at steady-state can be adapted to provide thermal energy to support Holos surrogate fuel cartridge. The power source utilized to validate WHRSs generates in excess of 5MW-thermal with near real-time adaptability as it is represented by a modified aviation turbo-jet engine. Megawatt-class compact heat exchangers and closed-loop thermal-to-electricity power conditioning systems are tested under all operational and off-normal conditions by controlling the test-rig power source. Individual Holos Quad subcritical power modules are designed to produce approximately 5.5MW-thermal at maximum power rating. By leveraging the currently operational WHRSs test-rig infrastructure, integration of specialized heat exchangers with the power source and transport of thermal energy from the power source to Holos surrogate fuel cartridge can be accomplished in 6 months. Accordingly, transients, normal and off-normal operational tests inclusive of Holos power module testing under design basis accident scenarios, beyond design basis accident scenarios and design basis attack scenarios can be safely executed. These activities support design fine-tuning with full-scale test validations of technical and safety performance.